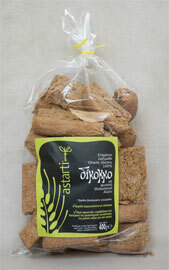 Astarti organic 100% Wheat dry bread-rusks (paximadi) with natural sea salt, double baked. 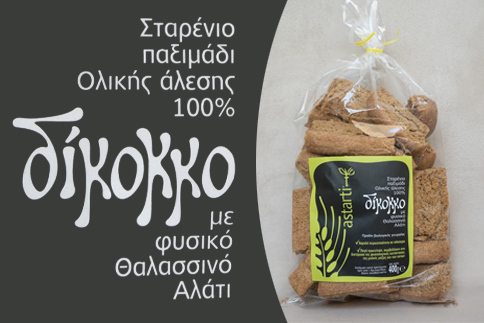 By following baking tradition of Kythera and according to the recipe we have created in the bakery in our village of Karavas, this unique paximadi (rusk) out of 100% wheat flour from an ancient Greek wheat variety called ‘Dikokko’. We chose the cleanest Greek certified organic raw materials, produced by small producers, such as whole grain stone mill flour and natural unrefined sea salt from the sea rocks of Kythira, the origin and value of which is guaranteed by Astarti. Note: The significance of a well balanced, varied diet and healthy life style must be emphasized. Tips for Use: In order to enjoy the maximum nutritional value of each paximadi, our Dietician suggests dipping very quickly into a bowl of tepid water to make it more palatable; drizzle half a teaspoon of olive oil over it to provide the beneficial vitamin E and good fats derived from the fruit of the olive; finally sprinkle with a little fresh oregano which possesses antiseptic properties. In addition, you may use it just like cereals for a healthy breakfast or in salads. For more tips of use on dry bread (rusks), you may visit this link from chef Mr. Eleni Psychouli . Regular shape small size Rusk (av. 20g per pcs), in plastic (PP) packaging of 400g.